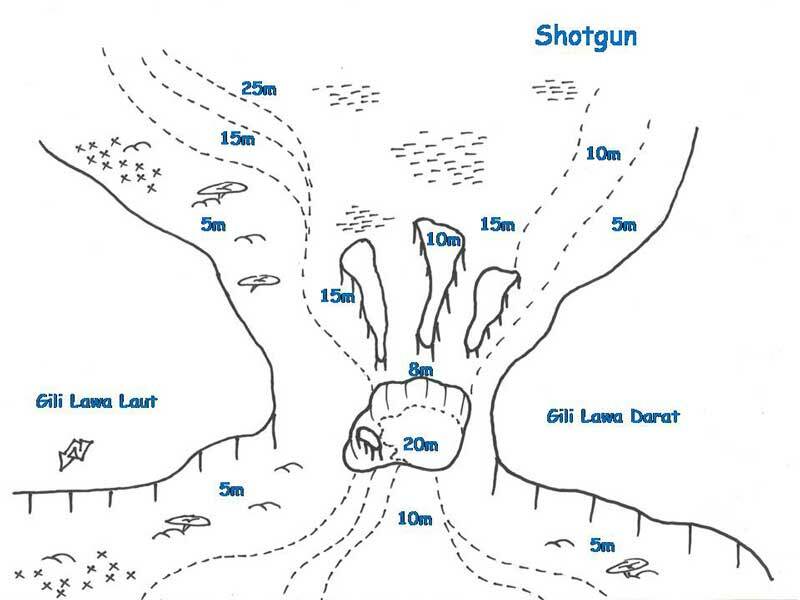 Shotgun is the channel between Gili Lawa Laut and Gili Lawa Darat. 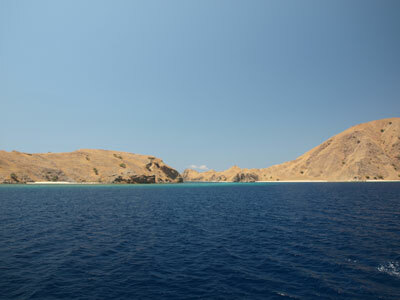 These two small islands are off the north-east corner of Komodo Island. An approximate GPS mark for the dive spot is 8º 27' 19.3"S 119º 33' 35.3"E (using WGS84 as the datum). The channel is located to the south-east of the GPS mark. 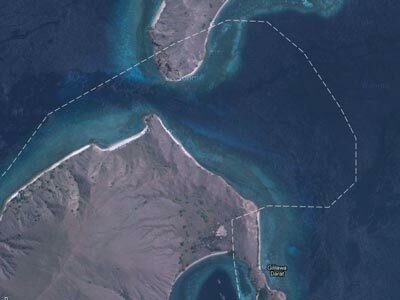 The actual site is the channel between the two islands. The water rushes through the 150 metre gap. I presume that the method of diving the site will depend on the flow of the current, although it is possible that it may always flow the way it was when we dived it. As with virtually all dive sites that you do when on MV Mermaid II, you use the RIB (rigid inflatable boat) to get to the start of the dive (and also to get back to the boat). The RIB will drop you normally a hundred metres to the west of the start of the channel. Once in the water we drop to about 10 metres and then head west with the current. It is not too strong at this stage, we slowly drift along getting deeper over the next five minutes to about 12 metres. After five minutes we come to the Fish Bowl. This is a very large amphitheatre which is much deeper at about 23 metres and has shear walls on the south and eastern sides. 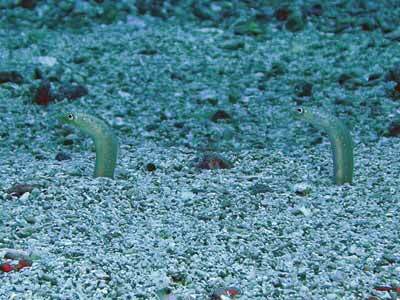 The bottom is a coral sand and home to lots of garden eels. Unless you are in the first group you will probably not see them at all. 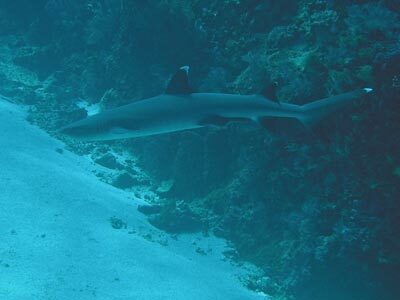 There are quite a few sharks patrolling this area, mostly white-tipped reef sharks. There are plenty of sweetlips and giant trevallies as well. 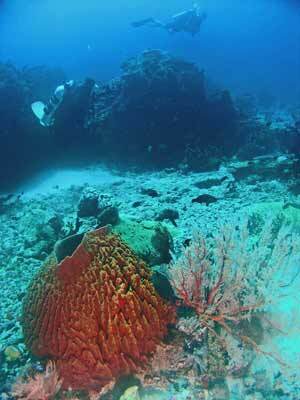 We spend about five minutes here before coming up to about 15 metres on the eastern and northern sides. 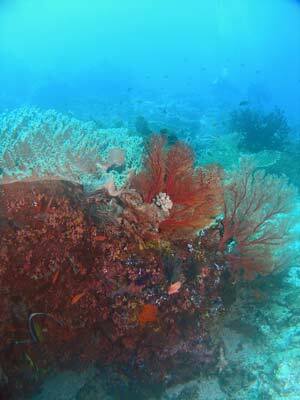 There are some nice gorgonias here and lots of fish, including clown triggerfish. To exit this area you head to the northern or north-eastern side of the Fish Bowl where you will see a canyon that runs to the north-east. This has a lot of fish in it and is very colourful. The depth goes from 15 metres at the point closest to the Fish Bowl to 3 metres. As you swim up this narrow canyon (probably two to three metres wide) you start your ascent, although you will rise up off the bottom. Following the right hand wall, you turn a little to the right and then ahead you can see that the top is about three metres deep. This is the exit out of the Fish Bowl area and the Shotgun. As you go the current picks up a little and care needs to be taken that you do not ascend too quickly. Soon you will fly up and over the shallowest section and then be able to descend to about 12 metres. 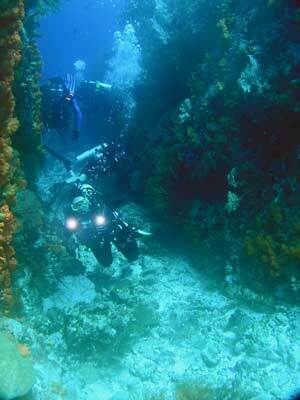 This is a much more open section, with a sort of gully and on your left, a shallower section of reef. Go to the bottom of the gully and drift along. You should not be going too fast. 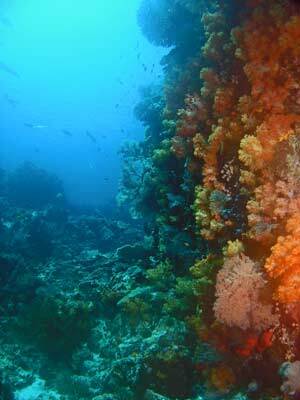 There are more gorgonias here and quite a few white-tipped reef sharks. After about five minutes we turned left and went up into the shallows. This is about 4 to 5 metres. In this section the current is actually heading back towards the west, although it is much lighter than the main current. We drift back west for about 5 minutes and then enter the main gully again and go back to drifting to the east. 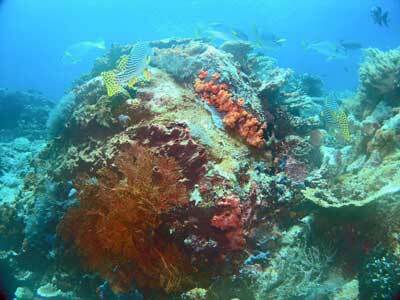 This gives us two goes at this section of the reef. We continue to drift for about 15 minutes before we ascend and do a safety stop in blue water. 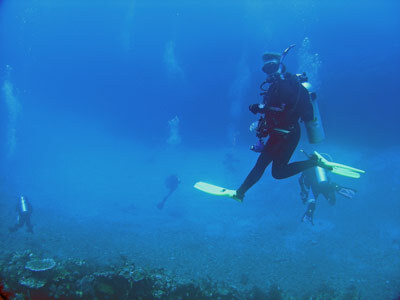 When we exit the water, we get the RIB to take us back to the start and we do the whole dive again, although this time we do not do the repeat section. This time the current once over the wall is stronger and we drift far further to the east, probably going about one kilometre in 20 minutes. We end up doing a 45 minute dive and then a 31 minute dive using the same tanks. This is how good the dive was. 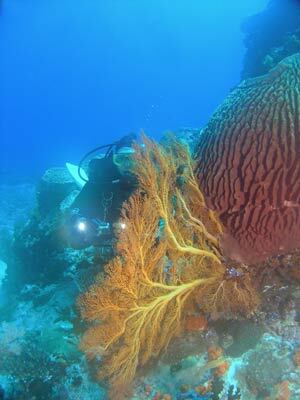 This was an excellent and exciting dive dive. 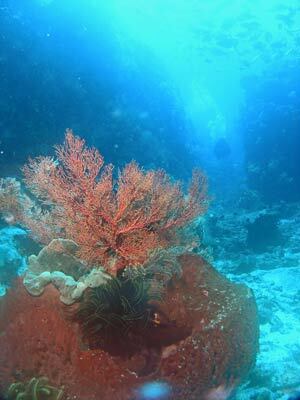 The visibility was at least 30 metres and the water temperature was about 27ºC. Click here to return to see the dive profile from my computer for the first dive.